After many years of wanting and trying to get OverDrive in my school library, it finally happened! I used OverDrive through the Fort Worth Public Library for many years when I lived in Texas, and I absolutely LOVED it. I was sooo thrilled to be able to initiate OverDrive in my library here in China. When I search for libraries in the OverDrive app, it looks like our library is only the fifth library in all of China to have OverDrive. Cool! So our OverDrive site went live last night! We are starting with 168 e-books and 26 audiobooks for our 400 Senior School students and teachers to checkout. I've promoted OverDrive heavily in my school since school started last month. Even though our site went live late on a Friday night, my students have already checked out seven titles as of Saturday afternoon. That is certain to shoot way up next week, when I am able to demo it at school from the live site. For those unfamiliar with the greatness of OverDrive, OverDrive is a digital books platform featuring e-books, audiobooks, and video for download. Librarians select and purchase individual books, which vary widely in cost and how long you have the item. I saw books as low as 4RMB (about 80 cents) and as high as 550RMB (about $90). My average cost per book for this first order was just under 50RMB (around $8). I did look for less expensive titles so that I could start with as many books as possible, but I also added a few pricier options that I knew would be popular with my students. Even though I looked for budget titles, I was still able to get lots of books that I know my students will love, including Vengeance Road (Bow), Prophecy (Oh), The Reluctant Assassin (Colfer), Buzz Kill (Fantaskey), The Caged Graves (Salerni), The Body Finder (Derting), Timmy Failure (Pastis), and The Templeton Twins (Weiner). Startup costs for my school was $3000 USD for 500 users. Half of that $3000 was redeemable in my choice of books and audiobooks. I went over the $1500 by about $500, so my grand total was $3500. Our initial subscription lasts one year. When we renew next year (and we totally will), it will cost $3000 USD, with half of that again redeemable in book selections. If we choose to add our Junior School students to the subscription, it will cost a total of $4000 USD (for 1000 users), with $2000 of that redeemable in books. We can always add more books to that $2000, and we very likely will. The majority of the titles I purchased do not expire as long as our school continues to pay for an OverDrive yearly subscription. None of my audiobooks expire, which is good because they were generally more expensive. They averaged around 200RMB each ($32 USD, still cheaper than many audiobook options). Sixty of my 194 titles are metered for only 26 checkouts. This means that after a metered book has been checked out 26 times, it expires. I can choose to either repurchase it or let it die. I feel this is more than fair since most print books in the library would have to be repurchased after 26 checkouts anyway. Any print book checked out 26 times would probably look pretty tattered anyway. Many books don't ever make it to 26 checkouts anyway because they get lost, damaged, or stolen long before then. At least with OverDrive, I know the book will actually get 26 checkouts before I need to replace it. So if a book is popular enough to have 26 checkouts, I am happy to repurchase it! Our initial subscription cost includes set-up, which I have to say was ridiculously easy on my end. Two OverDrive representatives, Christina and Bailey, helped me with set-up. As I am in China and they are in the USA, we did the entire thing via email. These ladies were rockstars! They answered all my questions quickly and clearly. They did almost all the work; all I did was shop for new books and upload my patron accounts in an ExCel document. The entire process, from my email requesting service to the day our site went live, took about three weeks total. E-books can never be lost, damaged, or stolen. OverDrive books automatically return themselves. No overdues! Users can customize font size, font style, font color (black or white), line spacing, and margins. OverDrive has a dyslexia font! I can't wait to try this with my dyslexic son. Audiobooks (at least the ones available to us in China) do not expire. Project Gutenburg is an OverDrive partner. 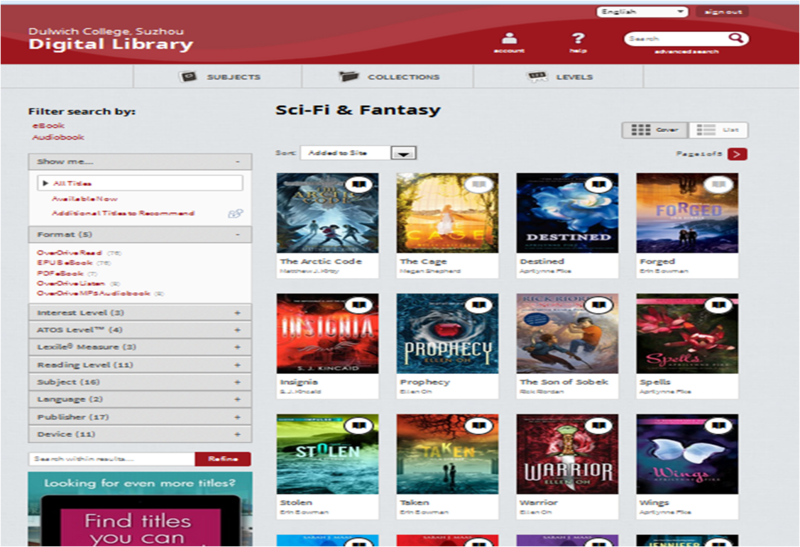 We have free access to 15,000 classic books within our OverDrive site. There are simultaneous-use titles available, which would be perfect for class sets. Titles purchased are available in hours, rather than weeks or months (great for international schools). International shipping for print books adds about 30% to the price of each book. With OverDrive, there is no shipping. Free MARC records that took seconds to upload. No cataloging, barcode stickers, spine labels, due date cards, or mylar covers. E-books take up NO SHELF SPACE!!!! Graphic novels are available. Graphic novels illustrated in color are also in color on OverDrive. OverDrive is available 24 / 7 / 365. My students can use the library even at 3am in the middle of summer break, from another country halfway across the world. OverDrive books are downloadable and can be read offline. Perfect for travel! For users in China, no VPN required! So based on my experience so far, OverDrive is getting an A+ from me. I am really excited to continue to promote it within my school next week, when my students can finally use the live site!